Fed up of the old stopcock and looking to have the best auto stopcock on the market, wondering how to protect your property from damage by internal flooding before calling an emergency plumber, then your looking in the right place. Please read the article that will explain everything you need to know. Martin Smith an experienced emergency plumber explains the stopcock problems, but most importantly what you can do to make life in the future stress free and more easy. 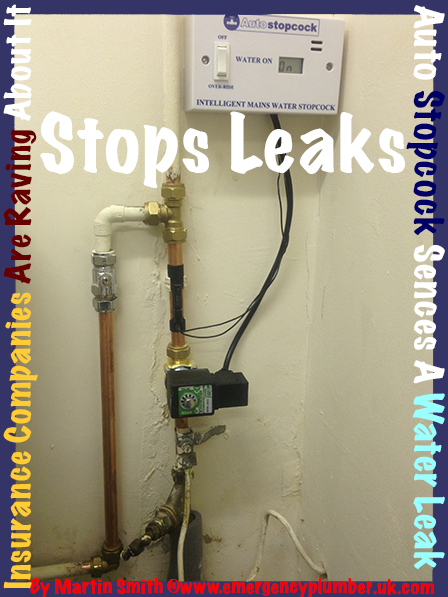 It is reported that 1 in 8 houses have some kind of water leak every year. Some really bad, some just small. But the problem is, the cost to the economy and the home insurance, which is the reason the insurance companies are now hoping for a better solution and a device that is intelligent enough to stop any water leaks. Martin the well known emergency plumber in the UK explains about the importance of the auto stopcock in comparisons to the standard mains water stopcock. We are a national plumbing company with over 400 engineer registered and specialising in plumbing emergencies. It is very important that we find a way of our homes from flooding and causing so much damage. It is very common to say that there are so many burst pipes that the occupant don’t know about and how to turn the mains water stopcock off. By fitting the auto stopcock, then the cost of the damage in comparisons to fitting, will dramatically drop down, saving the insurance company plenty of money. The more money the insurance companies save, the lower the insurance will go down. Martin Smith hopes emergency plumbers and occupants take this type of valve very serious and is a long term solution, rather than the patch up short term and just hope it works. If you work out the average cost to a valve and what the costs are to your insurance company including the excess you have to pay, then in the long term it is piece of mind and a damage free property to live in. There are always questions where emergency plumbers have been asked how to turn the mains water stopcock off, this is because the neighbour or occupant in the below flat is complaining of a water leak but unsure on how to turn the mains water stopcock off. The way forward in dealing with the water leaks and burst pipes is to have fitted the auto stopcock, what it does is detects that if there is a water leak by using a valve that senses the flow of water, it will then turn the water off, clever, but also saving further costs to the insurance companies and stress to the occupant living in the damaged property. To the left is everything you will get when receiving the auto stopcock, above is what the auto stopcock will look like once fitted. You will receive an intelligent box that you can turn on and off as pleased, the main valve, which operates the on and off as required. The wiring comes with 2-meters, however can be extended if necessary. 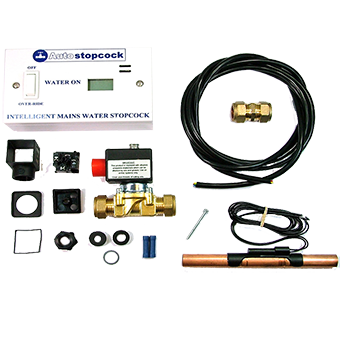 The auto stopcock is Wras approved, which means it complies with water regulations and is suitable for your water supply into your home with BS6920 approved fittings. The main box is battery operated estimated at 3-years batteries life but does not include the batteries, which are bought separately. You can buy a mains operated but must be made by a special order, there is frost protection, so if the water detect the temperature at 3°, then the valve will switch the water into the off position, the water can also turn off if an excessive amount of water is detected after 45-minutes, however, there is an override switch that will let water through if water is continuously being used after the 45-minutes on purpose. If there is no water in the house used within 72-hours, the water will also turn off, saving those on holiday from coming home finding a water leak. The size of the control panel is 145 x 85 x 30. This auto valve will detect down to 0.5-ltr / min on 15mm pipe or 1-ltr / min on 22mm pipe. Please note this article was written back in 2014 and may be subject to change.